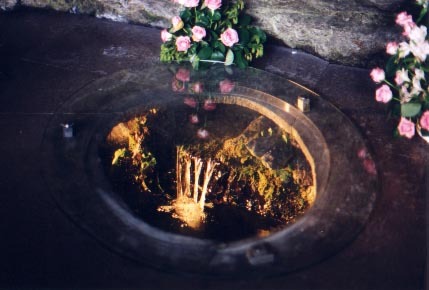 Lourdes water, a virtual pilgrimage ... visit now! ... Healing waters of Lourdes  The factual content in this site is remarkable and arguably the most compelling found anywhere on the web ... the most complete collection of printquality and oneofakind photos of Lourdes, the miraculous spring, and Saint Bernadette found anywhere ! "Catholic Pilgrims of Mary and Jesus" is devoted to collecting and sharing the most remarkable and irrefutable events and truths of the Catholic tradition. The factual content is arguably among the most compelling found anywhere on the Web. It's wealth of information and images, mostly from private sources, all concern various modes of Christian inspiration for our souls. A virtual pilgrimage, you may discover within these pages the seeds of your own inspiration. "I do not promise to make you happy in this world, but in the next" ... These words spoken by Mary to Bernadette at the third apparition on February 18, 1858 were a prophesy of Bernadette's life. This was the promise in return for Bernadette's total compliance with the will of the heavenly Mother. The happiness promised to Bernadette was not only intended for life after death. It is a happiness experienced by all those who progress in the way of prayer; who go beyond prayerful words to the discovery of true Prayer. It was this experience that Bernadette came to discover as she knelt before Our Lady. She went beyond the mere recitation of the rosary to savor the deeper experience of a loving communion, "of a friend speaking to a friend." There at the Grotto, Bernadette's deeply prayerful experience silently touched the hearts of all who watched, and crowds began to form in ever greater numbers as the famous Fortnight of Apparitions progressed. (The Lady) told me that I should go and drink at the fountain and wash myself. Seeing no fountain I went to drink at the Gave. She said it was not there; she pointed with her finger that I was to go in under the rock. I went, and I found a puddle of water which was more like mud, and the quantity was so small that I could hardly gather a little in the hollow of my hand. Nevertheless I obeyed, and started scratching the ground; after doing that I was able to take some. The water was so dirty that three times I threw it away. The fourth time I was able to drink it. She made me eat grass growing in the same place where I had drunk; once only; I do not know why. Then the Vision disappeared and I went home. "The Ninth Apparition is a culminating point of the Lourdes message. The water bubbling up and mixing with the mud from the inner recesses of the Grotto was to take on an unimaginably deep meaning. Much more than a mere purifying water which may sometimes produce miraculous cures, this water is the mystical sign of the water that flowed with the Blood from Christ's side, pierced by the soldier's spear. An enlightening coincidence, since it was at that time that an account of the Passion was being read in the Catholic liturgy. Without knowing, Bernadette had mimed the Passion "for sinners." But, as Bernadette was discovering the meaning of the Lady's message, only a few scarce people, such as Marie Pailhes, grasped the full gravity of the situation. Moved by the sadness upon Bernadette's face, "She seemed to carry all the sorrow of the world," wrote Pailhes. But as for the majority, they had callously behaved like the many who, on Good Friday, had abandoned Jesus, whom only a few days before they had so admired and loved. As Bernadette scratched the muddy ground and chewed the bitter grass, her friends and supporters one by one began to abandon their belief in the claimed visions.